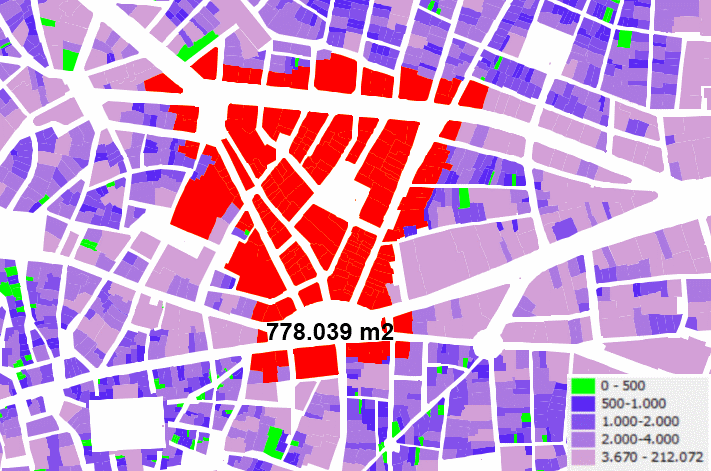 Madrid (municipality) and Montpellier (metro municipalities) at the same scale (1km grid). The core cities subject to specific programs are highlited. How large is a city? It is increasingly difficult to answer, as it is increasingly difficult to know what a city is. 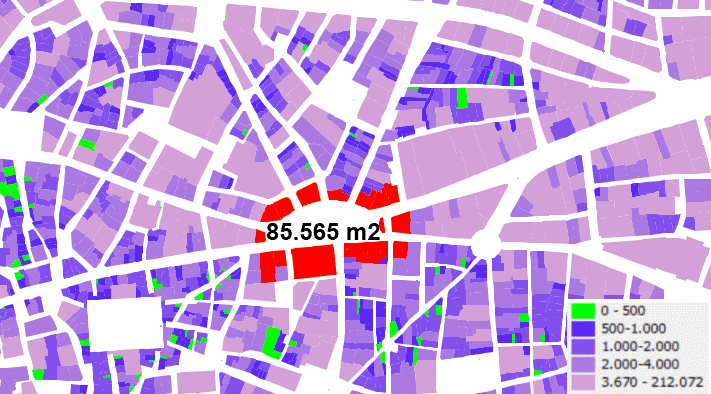 Anyway, if you take municipal limits, Montpellier is a city with a population slightly over 255.000 on a bit less than 57 sq km (compared to 605 sq km in Madrid, which has 12 times more population). It is common to see in France such a small municipal scale (over 36.000 municipalities when compared to some 8.000 in Spain, for countries with similar surface). So, in some matters, the correct comparison is not between municipalities, but between management logics for each space and each policy. 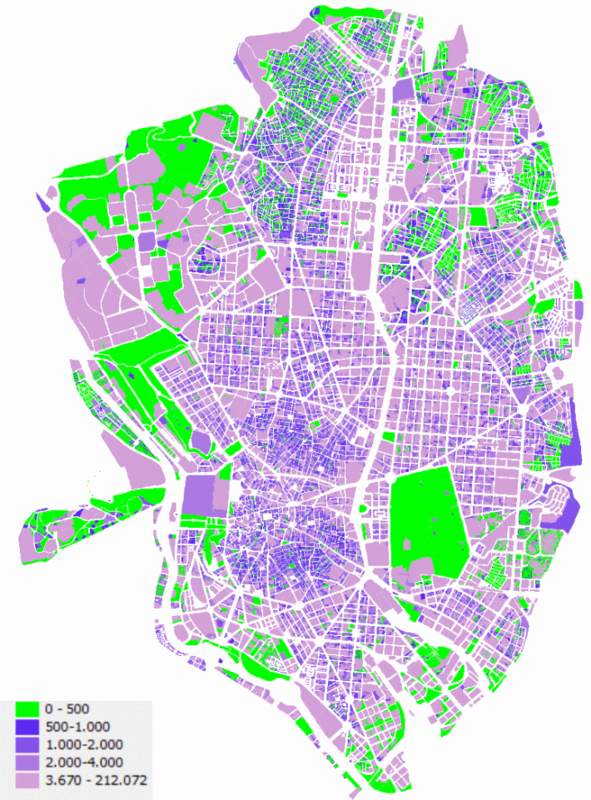 In urban planning terms, if Montpellier has its own Plan Local d’Urbanisme, the SCOT covers the 31 municipalities of a Metro area that has administrative powers, and more interesting comparison items appear. 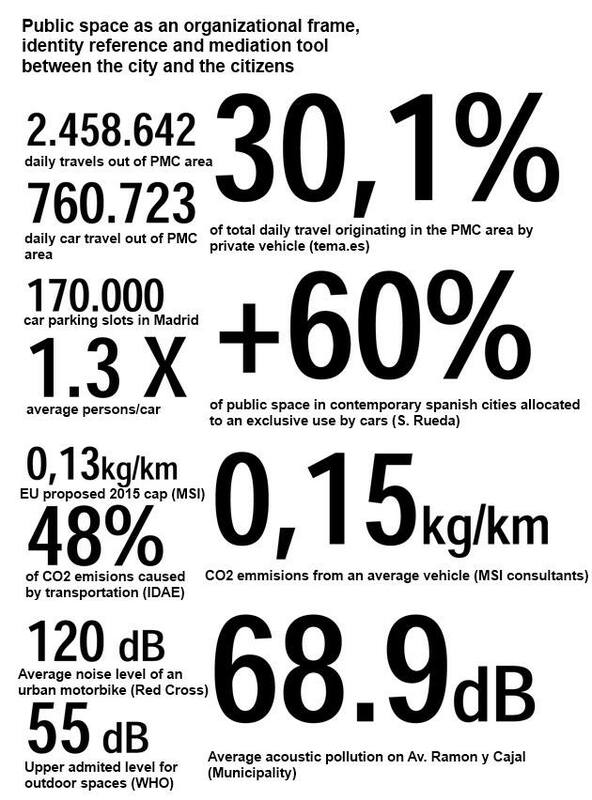 Nevertheless, when you compare the city with Madrid, it is striking to see that both cities have addressed the issue of their urban cores at about the same time (PMC in Madrid, Grand Coeur in Montpellier). Urban centrality is one of these complex concepts which are easier to recognize in everyday life than to describe with rigor and precision; this complicates (but does not prevent) actions to foster its positive effects. As some have said, the center is, simply, this place to which everyone wants to go; to some this means, ideally, the place to which young people go to learn, but also to celebrate, and older people go to work, but also to enjoy, and there is also a lot of residents. To others, it is place with many roles, but few residents so they do not have to endure the burdens of congestion. And in real life, it is not so much a geographically defined space, with a closed shape, immune to change over time, but an area that evolves even along a single day, in which the most central areas are those that around the clock maintain for longer that centrality condition, always marked by the ability to attract external people. What would be central Madrid? As it is a city with some history (although not that long, as somehow Madrid was to the European XVIth century what Brasilia has been to the American XXth), there are some physical limits; time and the inertia of capital infrastructure investments over decades have configured a space, coincident with the Centro ward, where converge the main transit lines and streets. It is the most iconic center nowadays, but up to the end of the XXth century it was the whole of the city, and this complexity is still apparent. The XIXth century Ensanche and the industrial extension towards Arganzuela only helped to stretch that center, an operation fostered also by the Gran Vía opening. The consolidation of the Ensanche for a century and its better socioeconomic conditions as compared to the slums of Tetuan and Puente de Vallecas, almost contemporary in their development, helped the rise to centrality for that space, and more clearly around its western edge. 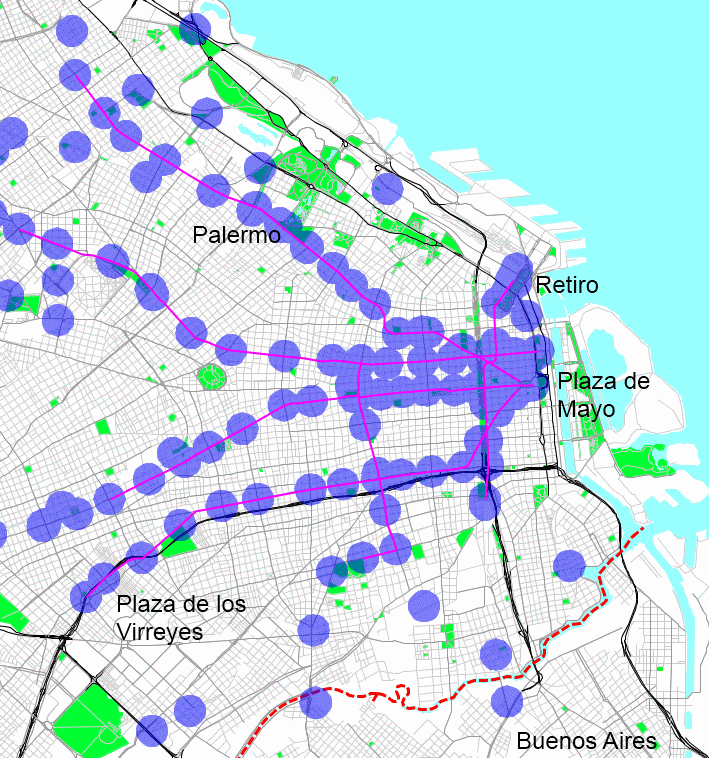 And the northbound extension configures an axis around the Paseo de la Castellana in which by the mid 2000s there were already 3 jobs for each registered resident. When we were called to write the Proyecto Madrid Centro (PMC), the City of Madrid considered that the scope for study and intervention should essentially be what is inside the M-30 beltway, which is as saying that the center of Metro New York is the whole of Mannhattan island, Paris 75 is the center of the Parisian metropolitan area, and the Ciudad Autonoma is the core of Buenos Aires. Work showed that this is just a simplification; on such scales the metropolitan dynamics and the fluidity of the transportation systems make for a more complex reality. 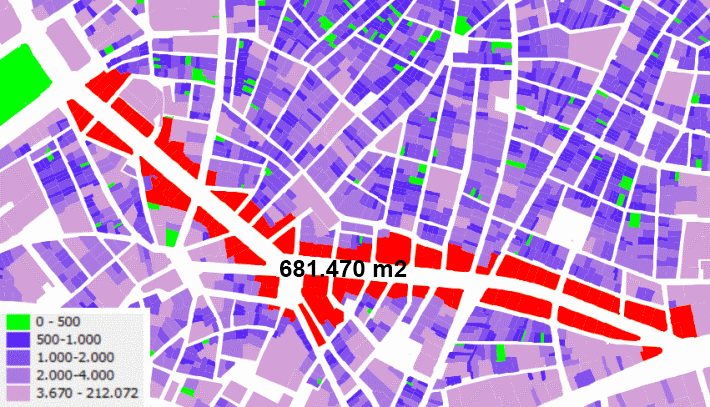 Real centrality, as a combination of multiple roles able to attract external populations on a large scale, is the overlay of the Castellana Axis, the Centro ward and the Barrio de Salamanca, but there are also more local centralities; their future is threatened by the economic crisis, which seems to reinforce the attraction of the most central areas, aided by tourism flows, when compared to neighborhood centralities, more stressed in their retail role. An elegant neighborhood is a space in which architecture has been developed with a greater quality over time as, simply put, its neighbors have had the money to pay for better buildings and they have maintained them. It seems Gangnam-gu is one of the richest neighborhoods in Seoul, but as the city was almost razed during the Korean war, this probably will only translate into an elegant area in the classical sense with more time (at least they have a song…). 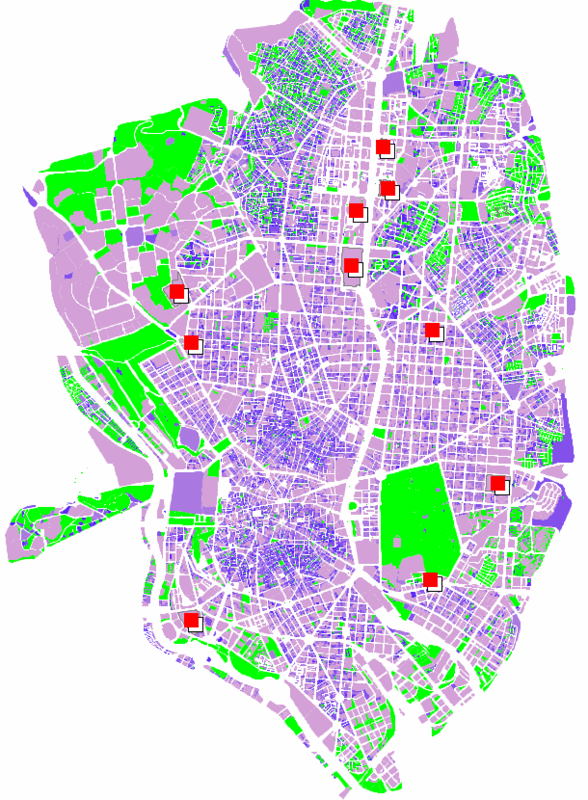 The Retiro area in Buenos Aires (some blocks north of Plaza de Mayo) and the Barrio de Salamanca in Madrid (north of the Retiro park) have been built mainly during the XIXth century. 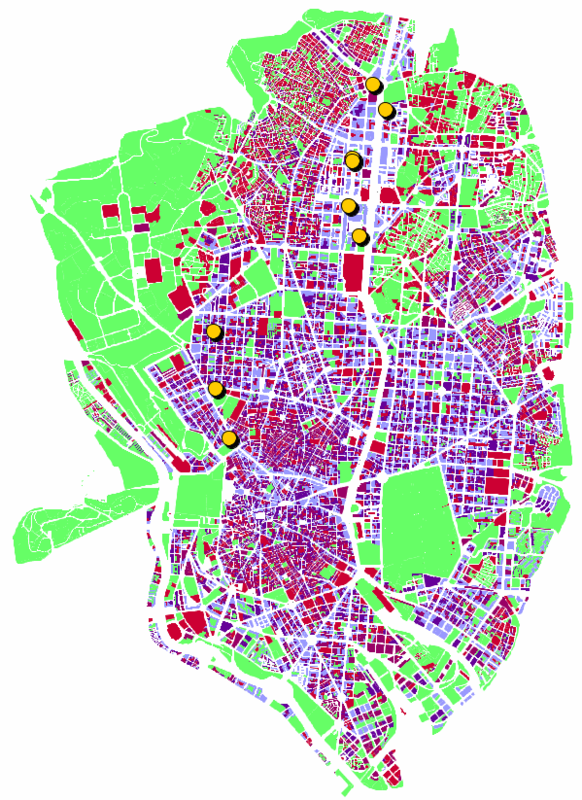 In Madrid the Salamanca area, projected as an integral extension of the city, is, as the Barcelona ensanche (a contemporary project) a tentative to use the grid as a directive principle. It has finally become the most exclusive neighborhood as those that had less money found less expensive opportunities out of the regulated city. 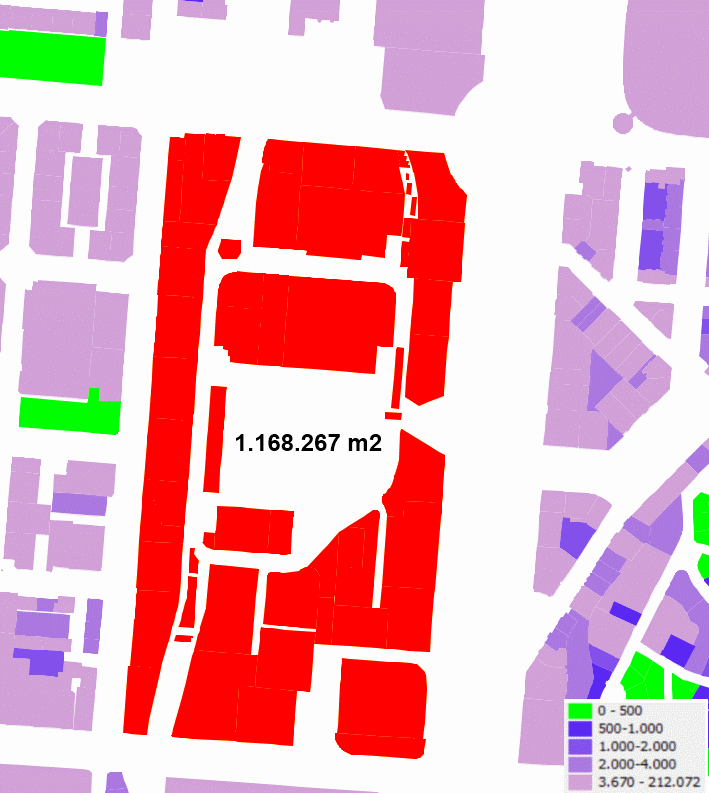 And it still is a highly valued area, albeit an extremely dense one; as in Barcelona the original building bylaws where changed allowing a more speculative development. Anyway, there are still two blocks east of plaza de Colón where you can still see the originally projected block model, with large central courtyards, usually “forgotten”. 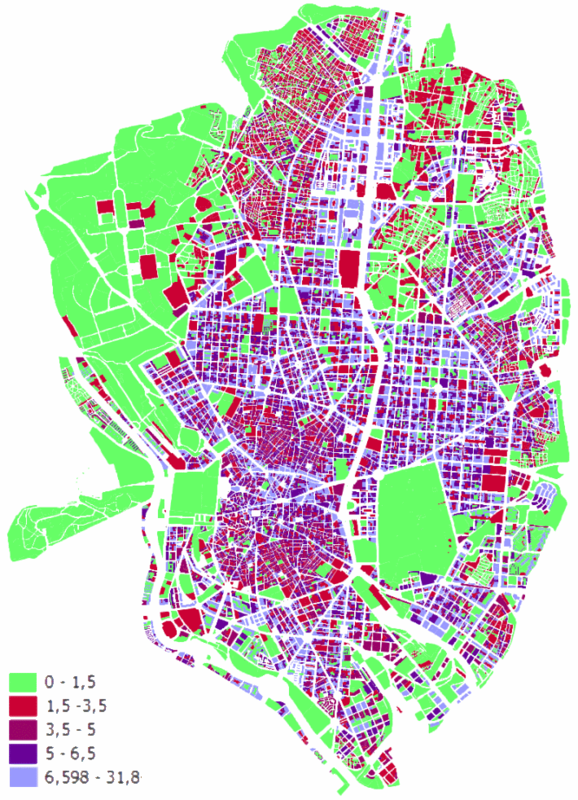 In Buenos Aires the Retiro district had no special intention to become different by layout or project. 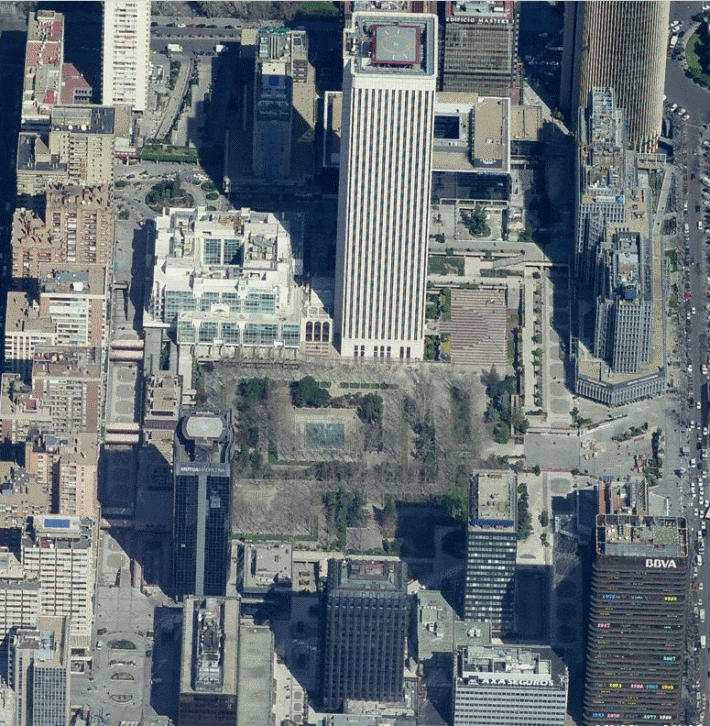 How would you differentiate you as a grid in a city that is a whole grid? In fact, it is a less regular grid than that of Madrid (one also adapted to preexisting elements). The neighborhood appears when the then rich citizens look for a new space after the 1871 yellow fever epidemics; Paris is the model for the architecture in a moment in which Argentina, as an agrarian power, becomes an emergent power. From the 1930s it is an entry point for modern architecture. After seeing what happens in several cities, a look at Madrid. Data from the Regional Statistical Institute shows that for five crops relevant to the average urban diet (wheat, corn, potatoes and olives), cultivation surfaces have diminished considerably, but for olive trees. Output has also shrinked in several cases, but following more erratic patterns (agriculture being an economic activity, farmers plant according to their benefit expectations). Productions by hectare usually have risen. This doesn’t mean that urban agriculture has no sense in Madrid, but that its real production capacity must well assessed, and that it is important to understand that its benefits are not only in food production, encompassing also social and environmental aspects. Architects tend to constitute associative bodies that defend what they perceive as their rights, and these associations have a certain legal status. 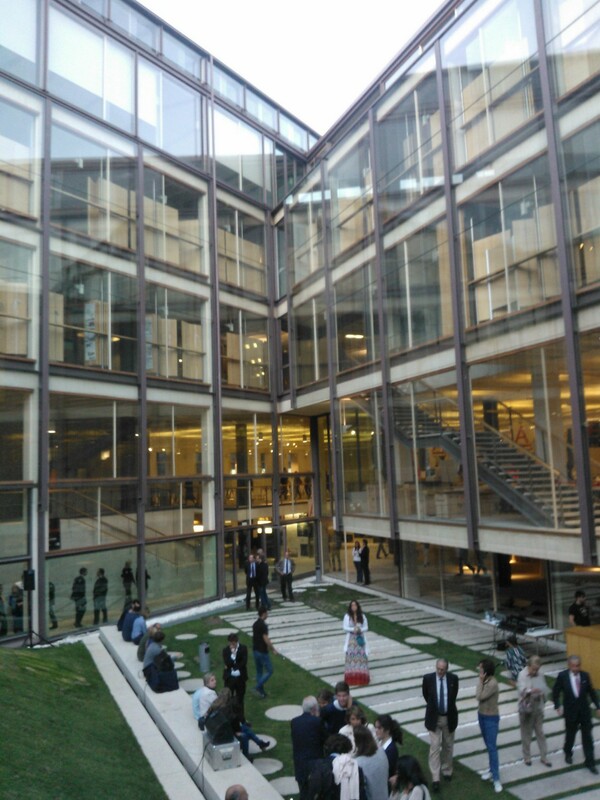 In Spain these entities are the Architect’s Colleges, and in Madrid we have COAM. The deep economic trouble, mostly linked here in Spain to the real estate bubble (with a direct impact on our business, with a sizeable proportion of Madrid’s architects unemployed) has had a clear impact on the organization. As often, even for non architect- related entities, COAM decided to move to new headquarters a short time before the bubble exploded, with all the associated costs. The long term impact of this operation on COAM’s finances (which faces regulatory changes that can become a much bigger problem) remains to be seen, but we can at least say that something good has been given to Madrid. The building seems well built and is well integrated with the street, but the main point to me is that it integrates, with a semi-public quality (enhanced by sharing the building with public equipments), a courtyard with an attractive landscaping. Madrid and other Spanish cities have lost over time, among other qualities, that of its courtyards as silent spaces with the presence of orchards and gardens, and here, even if there are no big trees, there are clearly positive elements. The project (by the architect Gonzalo Moure) integrates also other uses, as a public swimming pool with good views. These new headquarters opened some months ago, but to be honest yesterday night was my first visit, due to the COAM annual awards. 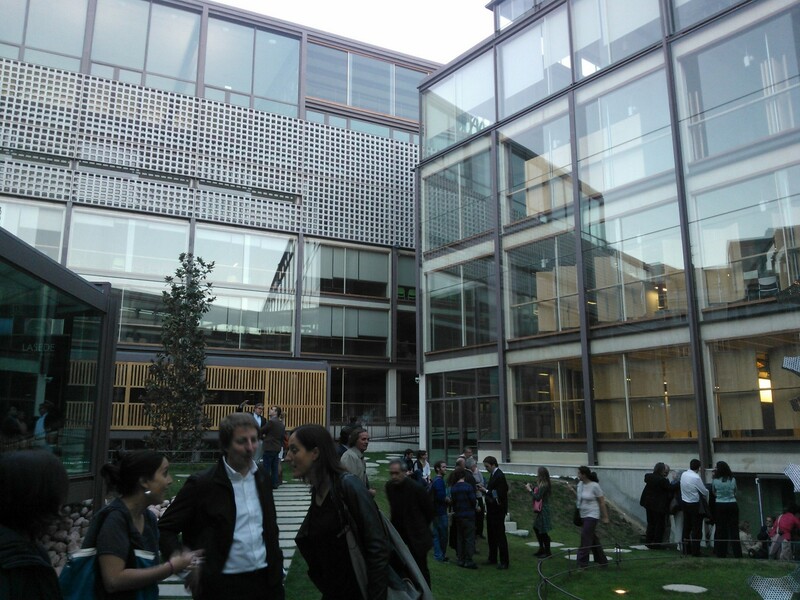 The visit was in part purpose driven (our Proyecto Madrid Centro was awarded), but also interesting. The Headquarters, or La Sede (so named in Spanish in the corporative image) is worth a walk, on 63,calle Hortaleza, with architecture- related exhibitions and cultural activities. 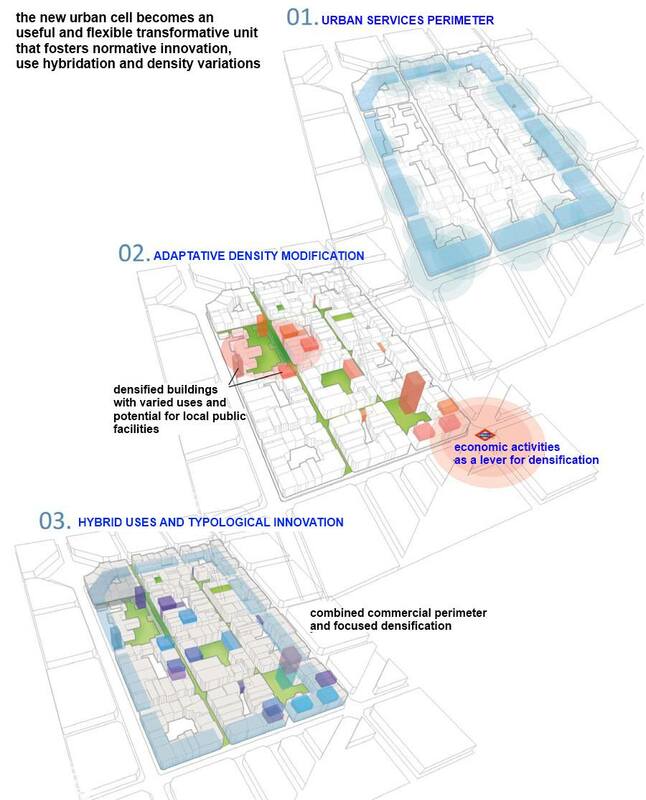 The Strategic Project proposes an alternative, radical but suitable for a gradual low cost deployment, to the need to limit the unrestricted vehicle access to the city core without harming the accessibility as an essential quality of centrality. 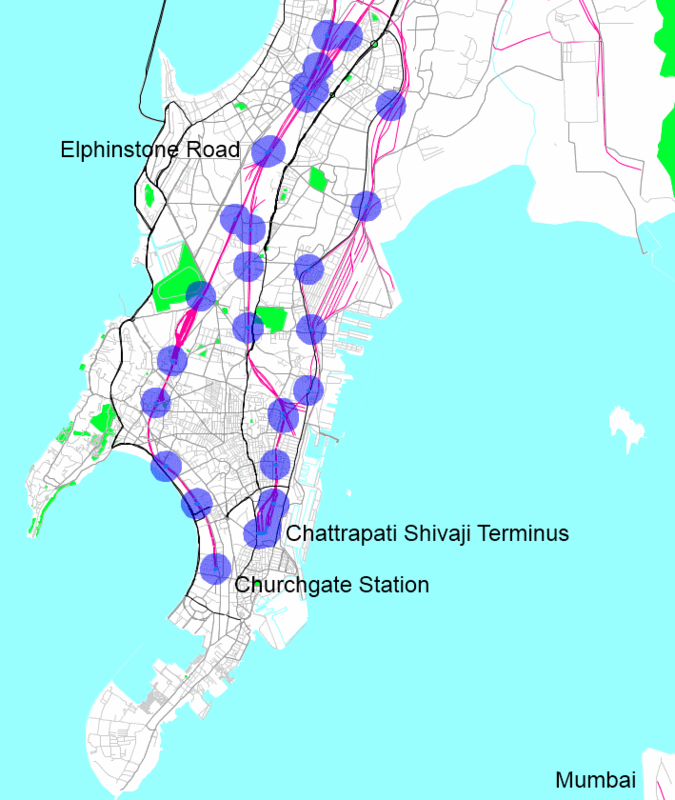 The main streets grid guarantees the public transit and automobile access to the whole of the urban space, but the secondary grid restricts the access to residents, creating so a complementary network in which pedestrian well-being, bike accessibility, trees and economic and retail activities become the main elements. 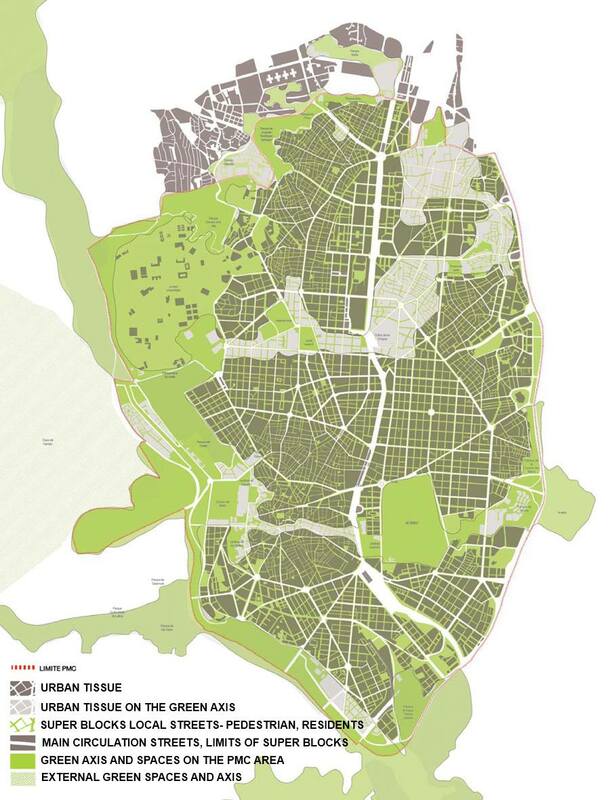 The new urban cell is also the coherent scale to reorganize the citizen access to neighborhood scale public facilities, a powerful asset to correct geographic differences. The quality of urban spaces can spark the transformation of the city, and this is only possible by a better space allocation to cars, pedestrians and bicycles, taking back a relevant part of the streets for uses that contribute to a better life quality without compromising economic vitality. The street is a reference for buildings, the place where mobility occurs, and, through retail on sidewalks, the basis for an interaction between the public and private realms. Working on the street design allows a new approach to its organization layout and also to that of the buildings that define its space. 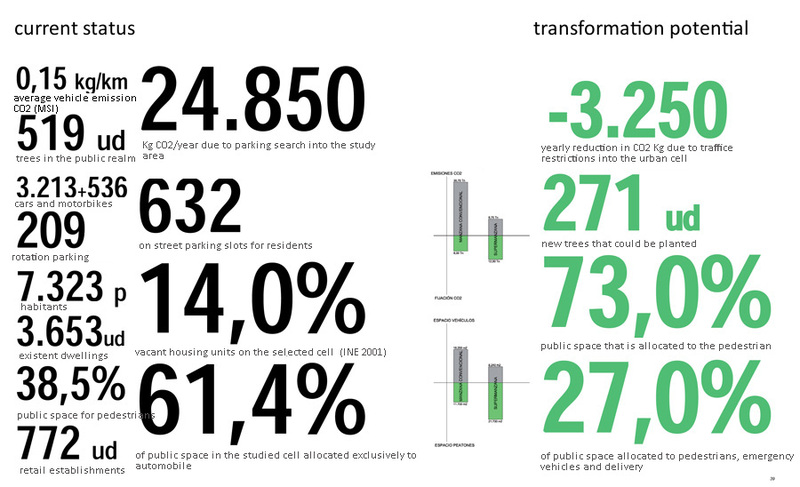 – An evolution from a current 70% of public space for cars to just 30%. 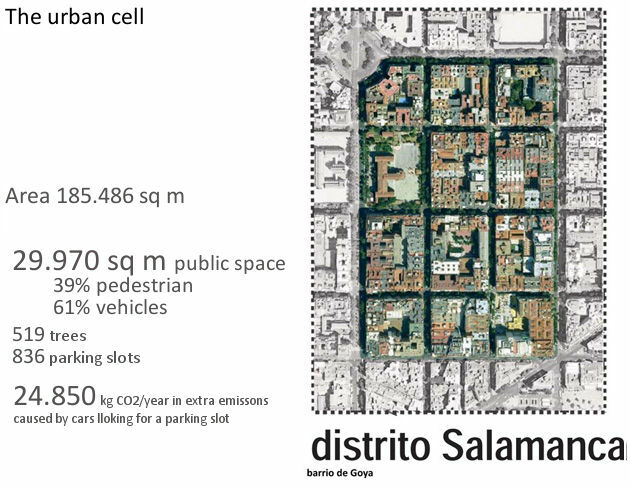 The concept of urban cell has been used in several projects by Salvador Rueda, Chairman of the Urban Ecology Agency of Barcelona, a member of the planning team (led by Ezquiaga, Herreros and Perez Arroyo). 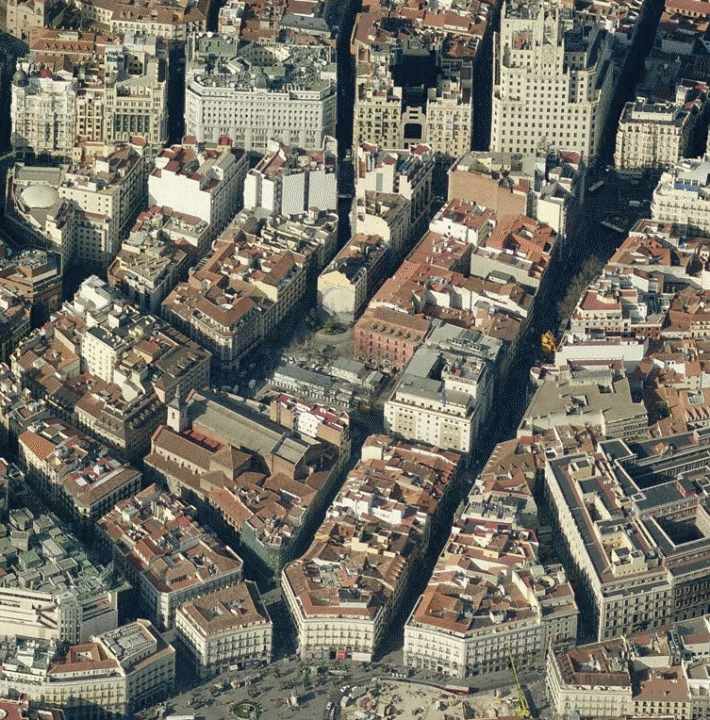 Next week will begin a series on the Proyecto Madrid Centro.